The second baby to be born with human immunodeficiency virus (HIV) to a mother that suffered from HIV/AIDS is reportedly in remission from the disease, as quick and hard treatment after delivery may have countered the disease’s spread. Last March, a Mississippi woman who tested positive for AIDS gave birth to a daughter who also carried HIV. Doctors administered treatment to the newborn within four hours, eventually setting the baby on a healthy path for the next three and a half years. 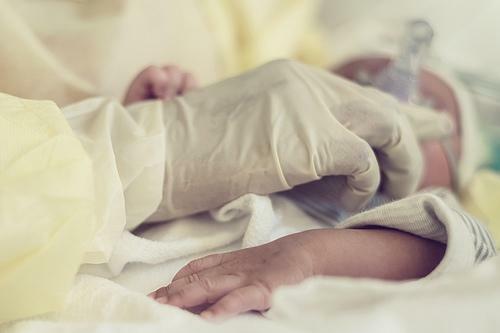 Now, Los Angeles doctors involved with the case of a child born one month after the Mississippi baby suspect the same rapid attentiveness may have staved off the virus’ infection, as treatment was delivered within hours after delivery. “We don’t know if the baby is in remission … but it looks like that,” Dr. Yvonne Bryson, an infectious disease specialist at Mattel Children’s Hospital UCLA involved with the girl’s care, told The Associated Press. When a baby is suspected of being in remission, her symptoms will be different than those of a patient receiving normal HIV treatment. The Mississippi baby has not received treatment for nearly three and a half years. Meanwhile, the L.A. baby is still receiving AIDS medicines, so experts can’t parse out what is the result of early treatment and what is the medicine at work — leading doctors to be cautious about tossing around the word “cure,” but Bryson at least acknowledges that’s the hope. Typically, mothers who are known HIV/AIDS carriers will receive medicine that minimizes the chance the disease will pass onto their children. However, neither mother was taking her prescribed medicine while pregnant. And according to Dr. Audra Deveikis, a pediatric infectious disease specialist at the hospital, the L.A. mother had a history of this behavior from another pregnancy, so doctors knew to be proactive in doling out AIDS drugs to prevent transmission. The baby later tested positive for the infection, but thanks to the early treatment shows no sign of the disease presently and is “looking very healthy,” Bryson, who is currently in the midst of a larger 60-subject study to test HIV drug efficacy on newborns, told the AP.